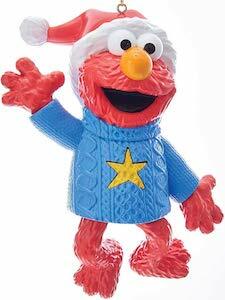 This Christmas your tree can have this Elmo In Sweater Christmas Ornament. Anyone that like Sesame Street and would like Elmo and his funny sounds in the Christmas tree can now have this Elmo ornament. The ornament shows the red Elmo and he is wearing a red Santa hat and is also wearing a blue winter sweater with a yellow star on it. Press the star and Elmo will show you lights and even giggles. Elmo is 4 inches tall and is not made for kids under 3. 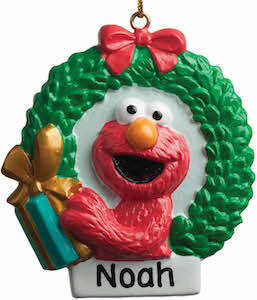 I am sure that this cute Sesame Street ornament will look stunning as part of your holiday decorations. This Christmas you can choose to have a Wonder Woman Christmas ornament in your tree. The Wonder Woman Christmas tree ornament is made by Hallmark in their keepsake series. The ornament shows Wonder Woman in a battle mode complete with a fisted hand and the other holding up her shield and she is is hiding her head behind. 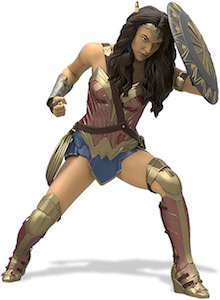 Maybe Wonder Woman in battle mode is not really festive but it is cool and this ornament is one you can keep out after the holidays too as there is not something specific for the holidays with Wonder Woman. If you like the Fantastic Beasts movies and the book then you are going to like this Niffler in suitcase Christmas ornament. 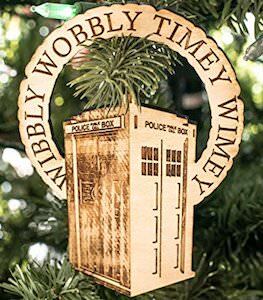 This ornament is great for in the Christmas tree but it is not especially festive and that makes this a great keepsake item even for after Christmas. The Niffler Christmas tree ornament is made by Halloween in their keepsake series and is about 2 inch tall. 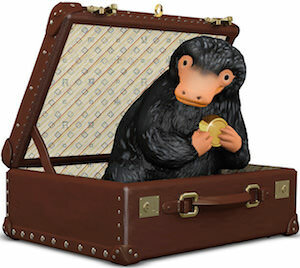 You can see that the Niffler is holding a gold coin in his hands and that he is sitting in the half open suitcase of Newt Scamander. 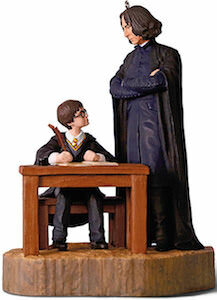 It is one of those ornaments that will look great for many years and it will remind you to rewatch the Fantastic Beasts movies. 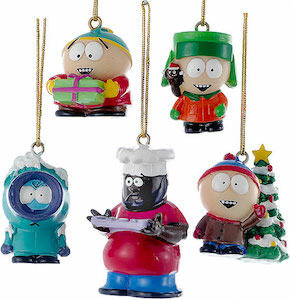 If you want a fun and festive ornament for in the Christmas tree then you should check out this Papa Smurf Christmas ornament. The ornament is part of the Hallmark keepsake series and shows 2 inches tall Papa Smurf that is dressed up like Santa Claus and he even has a big bag of presents. 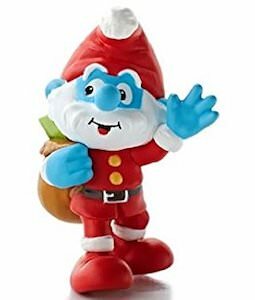 So this year Your tree can have a character with a white beard in your tree only this creature is blue as it is Papa Smurf and relooks pretty cool in the red costume he is wearing for the holiday. Just hang Papa Smurf in your tree and if you are lucky he may leave your some presents under the tree from the bag he is carrying. 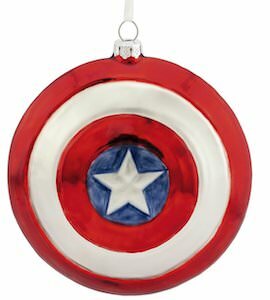 If you like Captain America and decorating the tree then you should check out this Captain America shield ornament. The ornament looks like the famous red, white, and blue shield on the front and the back looks like how it looks at the real shield back with the straps to hold it. The ornament is made from blown glass and that gives it the amazing colors you want for in your tree and the Captain America ornament is 4 inch tall and wide. So now your tree can have superhero protection all thanks to this Marvel ornament that looks festive on its own. 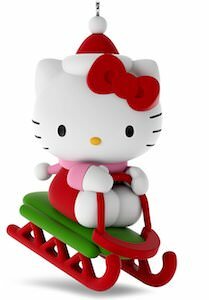 This is a Hello Kitty sleigh Christmas ornament and it is just so much fun that you want it if your Christmas tree this holiday season. This is a 2017 Hallmark keepsake ornament and it shows Hello Kitty dressed for winter and she is riding a sleigh and is wearing a Santa hat too. The Hello Kitty tree ornament is 2.4 inches tall and will look super fun in your tree as the colors of the ornament are just perfect for a tree. So if you like cute ornament and Hello Kitty then you should just go with this as it is an awesome ornament.